Work for the Art Now space in 2002 at Tate Britain. The aim of Art Now is to promote discussion and awareness of the quality and variety of new art in the UK and reflect current developments in contemporary British art. The piece was seen and experienced by 36,000 visitors, an audience unfamiliar with emerging art in London. The work was realized on a large scale using a variety of modern synthetic materials. The sculpture at over 5 meters across was then mounted into the ceiling just out of reach of the viewer. The visual references and components of the whole work appropriated passages from 20th century art and popular culture. Matt Franks was born in Yorkshire in 1970. After graduating from Goldsmith's College with an MA Fine Art in 2000, his first solo show 'transcendent plastic infinite' - for which he inverted traditional floor-based sculpture by placing it on the ceiling - was held at Tate Britain's Art Now space in 2002. Between 2001 - 03, his work was shown as part of 'Tailsliding', a British Council international touring exhibition featuring twelve young British artists 'currently creating eclectic work within the conventions of painting and sculpture'; for 'Into My World' (2004), a showcase for recent British sculpture at the newly re-opened Aldrich Contemporary Art Museum in Connecticut, USA, Franks was invited to take part in the associated Weir Farm Residency programme to produce a specially commissioned new body of work for the exhibition. Other recent exhibitions include 'Metropolis Rise: New Art from London' (ICA, London; Shanghai and Beijing, 2006), a major touring show supported by the British Council and Arts Council England; '8x8x8' at The Soap Factory, Minneapolis, London and New York (2006); and the Contemporary Art Society's annual selling exhibition, 'ARTfutures 2007', Bloomberg Space, London. 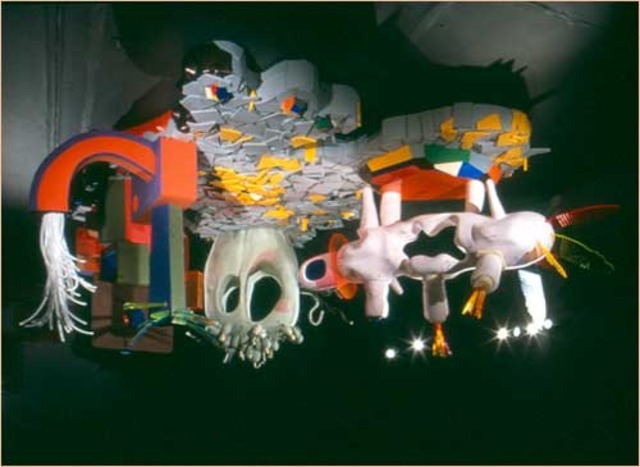 Franks' sculptural installations often feature assemblages of neon-coloured perspex and large, smoothly-shaped and hand carved blocks of styrofoam to produce bizarre and humorous forms. His first public installation for an exterior site in London, 'Fooooom!!!' - a three metre high, white exploding cloud - was recently on show at The Economist Plaza, London, commissioned by the Contemporary Art Society (24 January - 9 March 2007). Matt Franks is represented by Houldsworth Gallery, London.